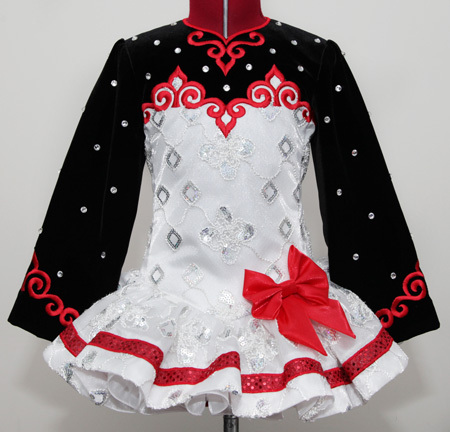 Dropped waist at seam: 26¾"
Centre front dropped waist to hem: 5"
Centre back dropped waist to hem: 7½"
Total back length (top of zipper to hem): 22¼"
White twinkle satin bodice with white sequin lace overlay, with pretty red embroidery design across bust and neckline. 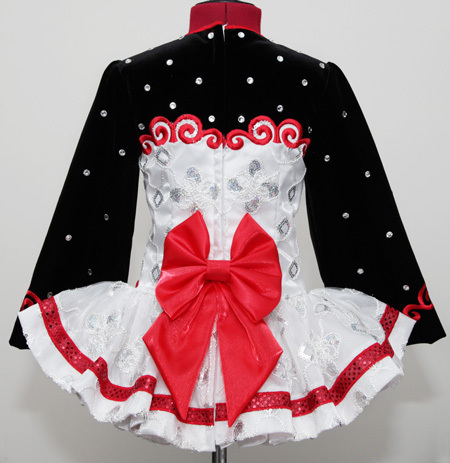 Sleeves and top of bodice constructed from rich black velvet with Swarovski SS40 crystals added for extra sparkle. 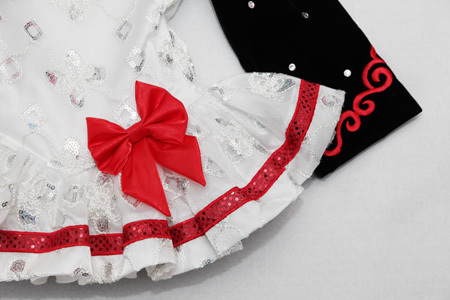 Modern style gathered wave skirt constructed from matching white satin with white sequin overlay and red sequin bind. Gorgeous small red satin bow attached to left side of dropped waist point matches a larger shawl bow on back of dress. Red and white ‘love heart’ cotton underskirt lining.